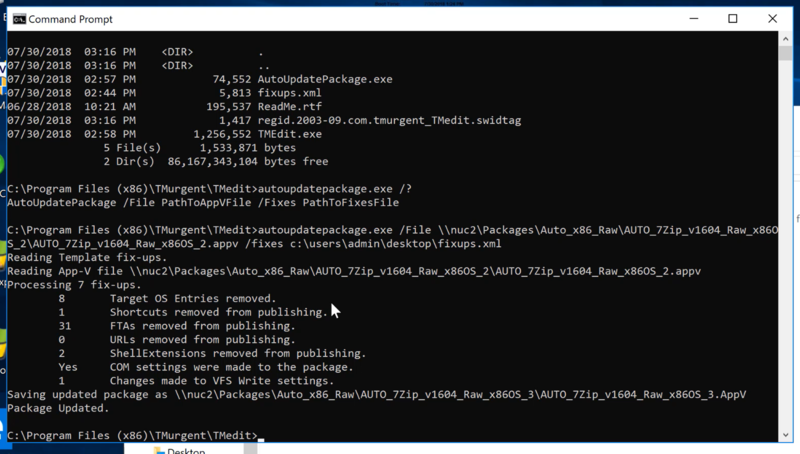 In addition to the TMEdit GUI interface, the product also includes a command-line utility called AutoUpdatePackage.exe that can make many basic package changes without a GUI. This is useful in scripting bulk or common changes to packages. The command takes two parameters, one for the App-V file to be updated, and another for the controlling policy file. Removing all Shortcuts, FTAs, and Shell Extensions from packages published via Citrix Storefront, Microsoft Remote App, or other application portal launchers. RES/Ivanti users that create their own shortcuts are also interested in disabling the shortcut publishing by App-V. Connection Groups require matching package settings for COM and others. 9-minute video showing you all this!